This is the tale of how the dashing Prince met and fell in love with the beautiful American actress. Despite their differing backgrounds and career paths, the royal couple are united in their commitment to charitable campaigns and devotion to one another. With lavish illustration... read full description below. A ROYAL ENGAGEMENT IS ANNOUNCED. At 10am on 27th November 2017, Clarence House announced the exciting news that Prince Harry is engaged to Meghan Markle, with a wedding planned for spring 2018. The Queen and the Duke of Edinburgh are delighted for the couple . The Duke and Duchess of Cambridge are very excited to hear the news about Harry and Meghan . 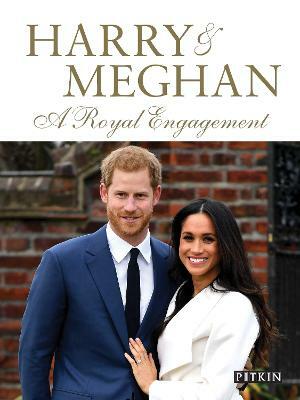 To mark the engagement of Prince Harry to Meghan Markle, Pitkin is delighted to publish this very special new royal souvenir in celebration of this truly modern love story. Born on 15th September 1984, Harry, christened Henry Charles Albert David, is the second child of Prince Charles and Princess Diana and younger brother to Prince William. Harry is the fourth grandchild of the Queen and Prince Philip, and currently 5th in line to the British throne. His bride-to-be Rachel Meghan Markle, known simply as Meghan, was born on 4th August 1981 and grew up in Los Angeles, California. She is the daughter of Thomas Markle, an Emmy award-winning lighting director of Irish and Dutch descent, and Doria Ragland, an African American psychotherapist and yoga teacher. As an accomplished screen actress, Meghan fulfilled her childhood dream of being a television star. This is the tale of how the dashing Prince met and fell in love with the beautiful American actress. Despite their differing backgrounds and career paths, the new royal couple are united in their commitment to charitable campaigns and devotion to one another. Meghan now faces a new chapter as she becomes a senior member of the Royal Family. We have no doubt that she will embrace this duty with her natural charm and elegance. With lavish illustrations and some previously unseen images, this is a souvenir to cherish. Halima Sadat is a highly experienced author and editor with a range of experience in journalism, biography and many of our Pitkin Royal titles.